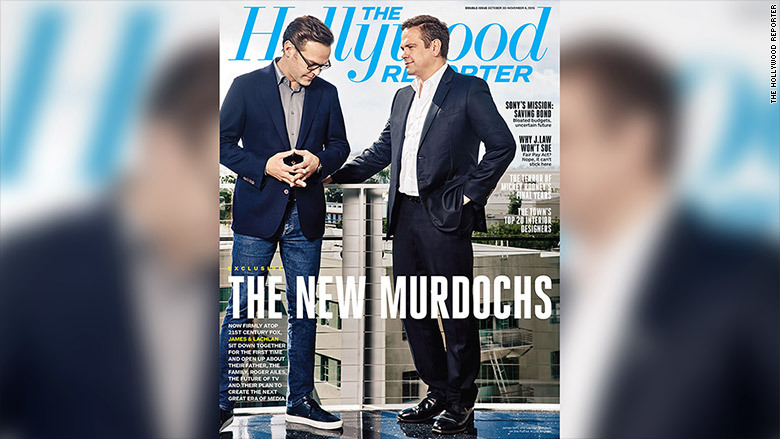 Three months into a brotherly power-sharing arrangement, James and Lachlan Murdoch say the partnership is going swimmingly. "I don't think we bicker," James says, disputing whispers in the media business. "I don't think we ever disagree," Lachlan says. Rupert Murdoch's two sons spoke to The Hollywood Reporter for a cover story that was published on Wednesday morning. It was their first interview together since James became CEO and Lachlan and Rupert became co-executive chairmen of 21st Century Fox. How does it work day-to-day? Even though James holds the CEO title, "functionally, everyone reports to both of us equally," Lachlan said. "We make the decisions together." In the interview, James repeated his 84-year-old father's chestnut that he's never going to retire. And Lachlan said Rupert's position "really hasn't changed." "What's happened is a generational transition to new management, and that's very important, but it's been very seamless, and he's still there guarding the company every day," Lachlan told interviewer Matthew Belloni. There's always ample intrigue about the House of Murdoch, given Rupert's well-known wish to see his children take over Fox. The leadership changes took effect on July 1. "As partners, so far, so good," James said. In the interview, James and Lachlan spoke at length about making big changes to adapt to consumer behaviors and digital competitors. Lachlan noted that he and James both have young children, and by seeing what and how they watch on the Internet, "it's great to see another way the whole ecosystem's changing." James reiterated his view that the advertising landscape is prone to evolution. "The current interruptive model of advertising, of cueing things up down the line and interrupting the programming for 12, 15, 18 minutes, is something that probably won't be tolerable for customers," he said. "That's not to say that I think everything is going to subscription," he added. "I think you're still going to see a mixed model, but a lot needs to be done." Belloni also asked about the brothers' much-scrutinized relationship with Fox News boss Roger Ailes, who pointedly said he would continue to report to Rupert despite the leadership transition. Fox later said he would report to all three Murdochs jointly. There's been speculation that the brothers don't have the same high regard for Ailes or for Fox's conservative political bent. But they signaled otherwise. "We have a huge regard for him, and he's done a great job," Lachlan said. James added, "He just signed a new contract and we're really pleased with that, and we hope he stays for as long as he wants." When asked about the ongoing feud between Fox and Donald Trump, stemming from Megyn Kelly's tough questioning at an August GOP debate, Lachlan said "part of our job is to protect" the journalists at Fox. James said, "The strongest thought that I had when I saw the beginning of that [feud] was just how awesome Megyn Kelly was."